Paul Jenkins is Global Managing Partner of Ashurst, a member of the firm’s Board and head of the Executive Team. His role involves leading the firm across its 25 international offices in Asia, Australia, Europe, the Middle East and North America. Paul was a key partner involved in the 2012 merger between Blake Dawson and Ashurst. 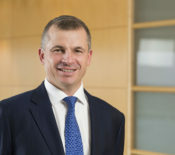 Prior to his appointment as Global Managing Partner in June 2016, Paul also successfully co-led Ashurst’s global Finance practice, where he provided clients including Australian and international financial institutions, and major corporates with advice in relation to banking and finance matters with a particular emphasis on corporate finance, debt capital markets and securitisation. Paul is a qualified solicitor in New South Wales and England and Wales, and spent a number of years practicing internationally, including in the UK and Asia.